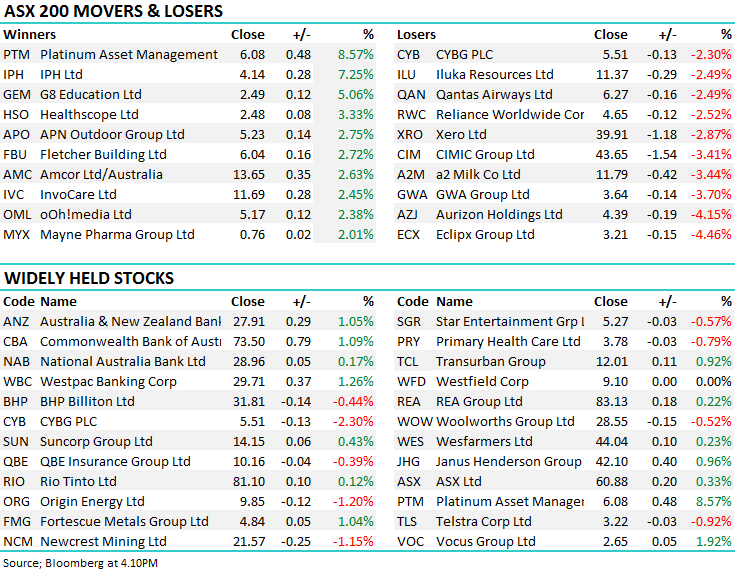 All eyes appear to be on tonight’s Federal Budget with low volumes and a lack of direction seen across the board today. For the fourth day in a row the market poked its head above 6100 but failed to close ahead of the milestone. As suggested in the AM report this morning, the market feels a touch “tired” around the 6100 area and a few more day’s consolidation &/or a pullback towards 6040 would not surprise. 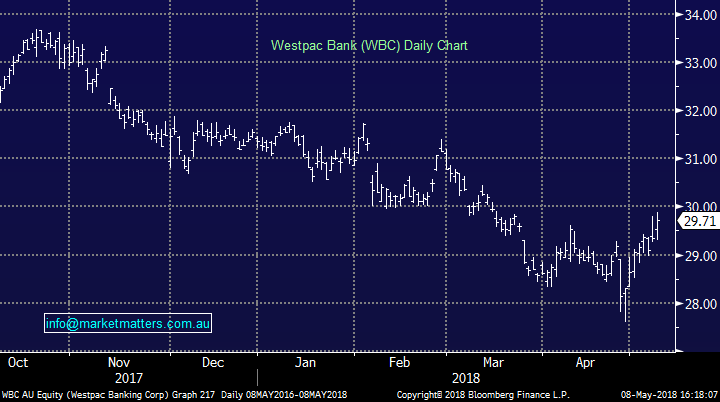 Banks were firmer today with Westpac the strongest link on the back of yesterday’s strong result - the bearish UBS report on the bank now a distant memory after it seemed WBC CEO Brian Hartzer tore apart the data set that was used to support the rationale…UBS have a SELL and $26.50 PT on WBC (not shown below as they have pulled the feed from Bloomberg it seems) while the rest of the market sits well above that – Bell Potter the latest to upgrade WBC to a BUY from hold yesterday…We remain keen in the banks into the current vortex of negativity and can see the next leg higher in the market largely being driven by buying in the sector. 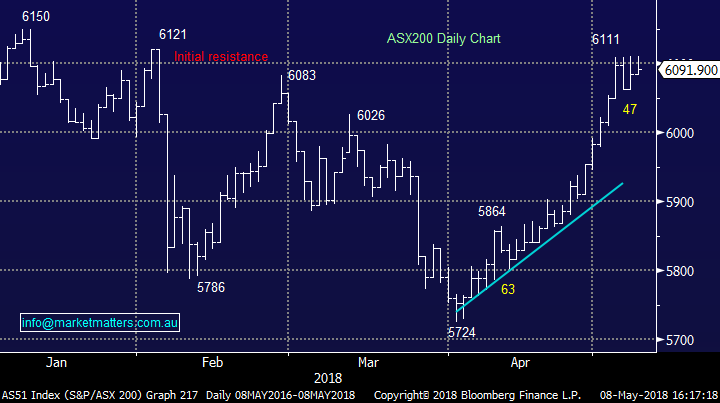 Looking elsewhere, the resource stocks saw some selling after a period of strong performance in recent times however we continue to think that a short term top courtesy of a resurgent US currency is a short term headwind. 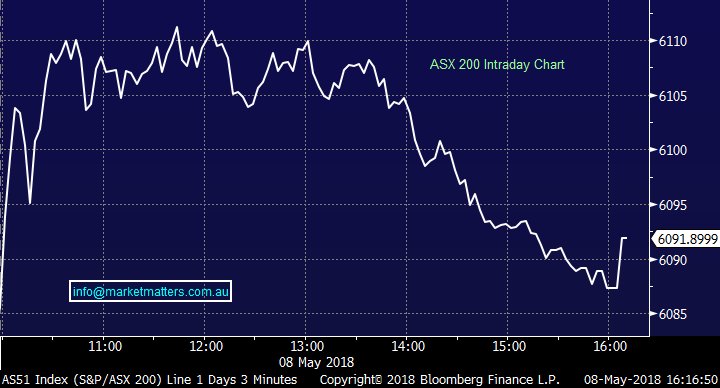 Overall the ASX 200 closed up 7 points or 0.12% to 6091, around 20 points below the intra-day high. Broker Moves; Platinum was helped higher on upgrades from two brokers, rare good news for an asset manager. Woolworths was slightly softer after Shaw & Partner’s Danny Younis questioned the supermarket’s multiple and lack of growth. Woolworths Ltd. shares don’t deserve 45% premium to market because company is set to deliver only 4%-9% profit growth in FY19, Shaw and Partners analyst Danny Younis says in report. Clydesdale (CYB) $5.51 / -2.3%; CYBG was weaker today following news of a potential merger between the UK bank and Richard Branson’s Virgin Money. The proposal sees an all scrip offer to Virgin Money shareholders that would have valued Virgin at a ~31% premium had their share price not run 14% in the last few days, which looks like some market participants new of the impending announcement. As of last night’s CYB close, it was equivalent to a ~15% premium for VM holders. The deal looks like a good fit for both parties, it merges a strong personal banking group in Virgin Money with a business banking focussed Clydesdale. Virgin is also light on in terms of a digital footprint, while CYBG has its own digital banking business. This announcement is early days in the process and the ultimate deal is a long way off, however as with a lot of businesses that embark on a large corporate transaction that will bear fruit in the long term, the short term share price can suffer. 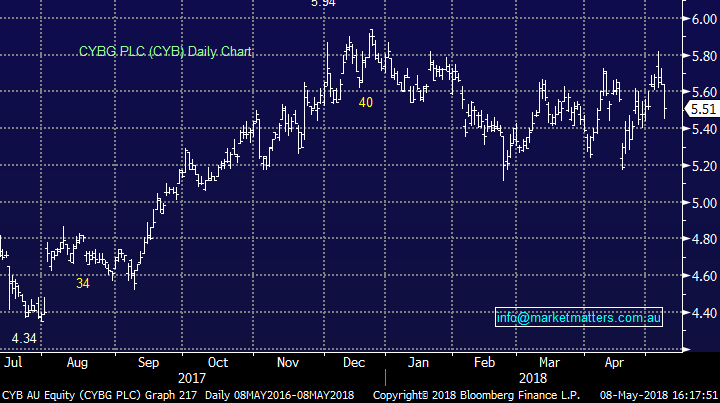 Our $6.00 price target for CYB was looking good…now less so.